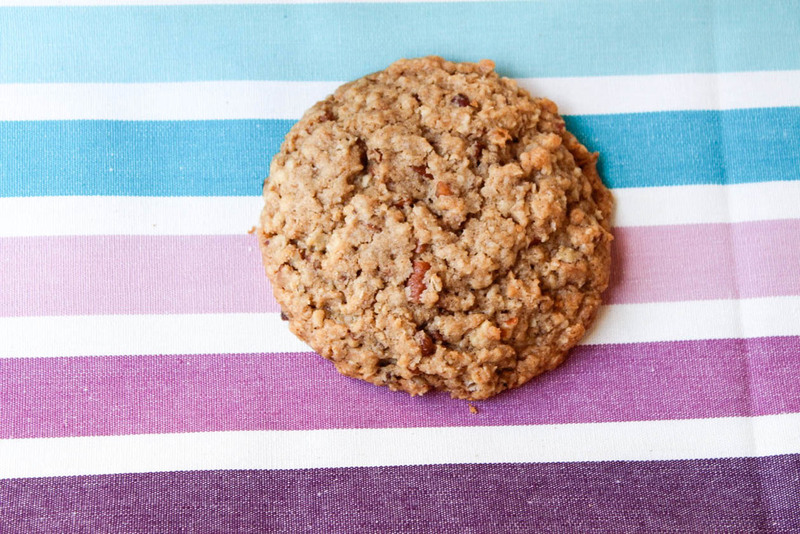 oatmeal pecan cookies — Mel bakes things. I am a sucker for all things oatmeal, with one exception. I completely fail to understand why anyone ever decided it was a good idea to put raisins into oatmeal cookies. Oatmeal raisin cookies are just...not my thing. I feel okay about raisins, generally speaking. But once you put them in a cookie, I'm out. I won't even waste my time picking the raisins out. Nope. No thanks. This recipe, from the Bouchon Bakery cookbook, was made specifically for someone else who also hates raisins in their cookies. Obviously, I was interested. I didn't expect anything earth shattering, just a decent oatmeal cookie. These cookies are actually pretty dang spectacular. 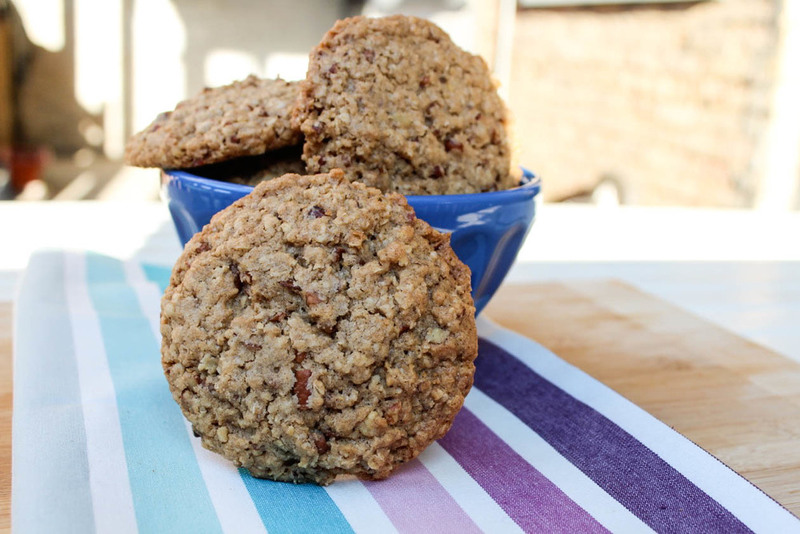 The pecans add an unexpected sweetness and crunchiness, and lots of oats make the cookies hearty and dense, but still chewy. I almost called the cookies "meaty" just now, but realized that is a decidedly gross word to use when referring to a cookie. Place flour in a medium bowl and whisk in baking soda, salt and cinnamon. In another bowl whisk together the two sugars, making sure to break up any lumps. In the bowl of a stand mixer fixed with a paddle attachment, place the butter and cream until it hold a peak when the paddle is lifted. Add the sugars and mix for 3-4 minutes. Add vanilla paste to bowl. Scrape down sides of the bowl and mix for about 30 seconds. Add eggs and again mix for 30 seconds and then scrape down sides of the bowl. Add half of the flour mix and mix on low speed just until combined. Scrape down bowl again and mix in the rest of the flour mixture, just until combined. It's important not to over-mix the dough. Add oats and pulse the mixer 10 times to incorporate the oats. Add pecans and pulse a few more times to combine, scraping down the bowl again if necessary. Preheat oven to 325F, position racks in the upper and lower thirds of the oven and line two cookie sheets with parchment paper. Divide the dough into 12 equal portions, roll each one into a ball between the palms of your hands. Bring the cookies to room temperature before baking. When done, remove pans to a cooling rack for 5 minutes, then transfer cookies to cooling rack to cool completely.